Looking from the outside into the temple while the Buddhist monks perform their evening prayers offers you a glimpse of the beauty held within the sim (as it is called in Lao). 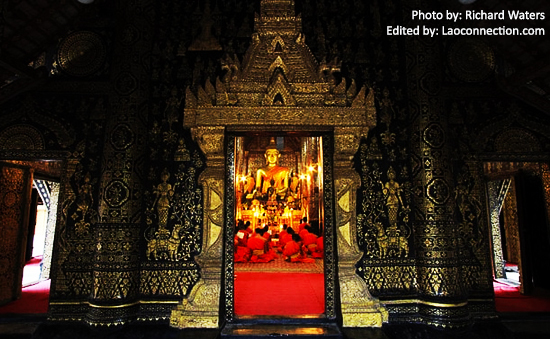 This temple, Wat Mai, in downtown Luangprabang is one of the nicest Buddhist temples in the city. It's very unassuming initially as you may pass it along Sisavangvong road but upon closer inspection you see its beautiful exterior. And incidentally as there are no parks nearby, during the day the temple grounds are often a playground for young children.